See List of fortifications for a list of notable fortified structures. For city walls in particular, see List of cities with defensive walls (regional list: List of town walls in England and Wales). The Walls of Ston are a series of defensive stone walls, originally more than 7 kilometres (4.3 mi) long, that surrounded and protected the city of Ston, in Dalmatia, part of the Republic of Ragusa, in what is now southern Croatia. The Great Wall of China, China - part of UNESCO site 438,. This is mostly referred to the Ming Great Wall, built from 1368 to 1644, measures 8,850 km long. Great Wall of Qi, the oldest of the Chinese Great Walls. Great Wall of Han dynasty (206 BC–220 AD), the longest Great Wall in history. Wat's Dyke parallel, for part of the distance, to Offa's Dyke, England:Wales. Long Wall of Quảng Ngãi in Quảng Ngãi, Vietnam. 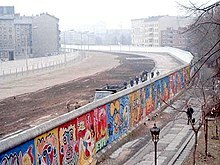 View from the West Berlin side of graffiti art on the Berlin Wall in 1986. The wall's "death strip", on the east side of the wall, here follows the curve of the Luisenstadt Canal (filled in 1932). The Wall In Concert (theatrical) - While based on a figment of a main character's imagination, the concerts in the tour for the Pink Floyd album The Wall featured a real wall of giant cardboard bricks between the band and the audience which was constructed, completed, spoliated and finally destroyed during the course of each show. ^ "Stonske zidine". Citywallsdubrovnik.hr (in Croatian). Društvo prijatelja dubrovačke starine. Archived from the original on 2010-05-31. Retrieved 2009-12-06. ^ UNESCO World Heritage Centre. "The Great Wall". Retrieved 6 December 2014. ^ a b c UNESCO World Heritage Centre. "Frontiers of the Roman Empire". Retrieved 6 December 2014. ^ Jon Herskovitz (December 31, 2007). "North Korea asks South to tear down imaginary wall". Reuters. Retrieved 2015-10-09.